Virtual-, augmented- and mixed realities are a perfect way to simulate travel through space and time. Great opportunities for exploring ancient civilizations. But what do these new realities have to offer and what distinguishes one from the other? Get acquainted with each of them and discover the cool stuff that you can try at home right away. Let’s have a look. Virtual Reality (VR) is an immersive experience generated by a computer. VR headgear can transport you to another world, where for example you can walk with dinosaurs. All you need for a basic set-up is a mobile phone with gyroscope and a Google cardboard. A fancier option is the Samsung Gear VR. High-end versions are Occulus Rift and HTC Vive. If you want to try the basic version at home, have a look at our favorites and how to get started: VR tips and tricks. 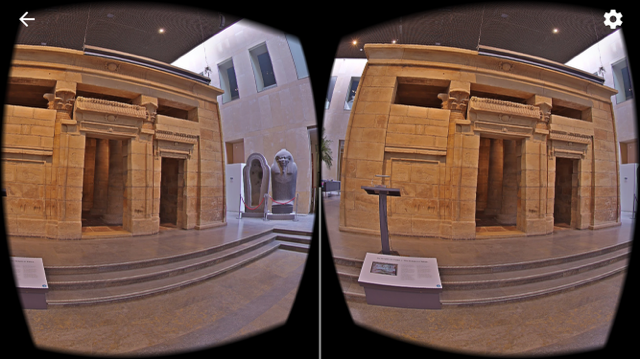 The Google cardboard app and Google street view app are a great place to start your virtual journey. Augmented Reality (AR) is less immersive than VR. It enhances your current perception of reality by adding extra information, for example text notifications or simulated screens. Pokémon Go made AR very popular for a broad public, but these days most attention goes to the more advanced possibilities of Mixed Reality (MR). MR combines the best of both realities. You see the real world with virtual objects that seem real and that become larger when you get closer. A well known example of MR is the Microsoft Hololens. A very interesting experience, although we do not know of any applications focused on ancient cultures yet. Let us know if you do!